5. 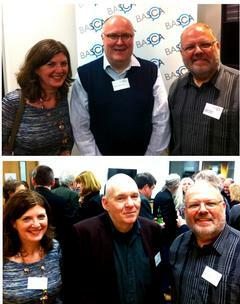 Rosemary, Stephen McNeff [Chairman of BASCA´s Classical and Jazz Executive Committee] and David. How can BBC Radio 3 better serve the Composers´ Alliances all around the country (which form the backbone of professional and semi-professional composers in the nation) in creating a more transparent process to submitting works for broadcast? 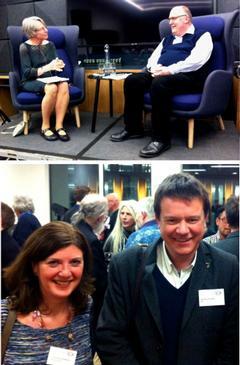 "Courtesy of BASCA I attended a very interesting evening with Alan Davey CBE, newly appointed head of Radio 3 who presented his vision to a packed room of classical composers at the PRS offices in London this month. It seems Radio 3 is in safe hands with its new controller, who has the goal of Radio 3 becoming more widely understood, and being the best radio station in the world. NIcola LeFanu’s interview gave us a chance to hear Alan’s plans for a more curated approach, with room for more contemporary music, sound that is not compressed, and to become known for quality. The evening then opened up to questions, exploring how can composers receive a greater profile (rather than the prevailing tendency to feature soloists and conductors foremost) and possibilities of representing regional classical music, and even jazz more. It will make for an interesting journey to follow." Arts Council England´s chief executive Alan Davey took over as Controller of BBC Radio 3 in January 2015 after seven years at the helm of the arts funding body. He described Radio 3 as "one of our most important cultural institutions and a beacon of excellence". He takes over from Roger Wright, who has left Radio 3 after 15 years to become chief executive of Aldeburgh Music. Mr. Davey said: "It is an honour to be asked to lead this wonderful institution and to renew it for the digital age, helping new audiences to encounter the wonderful things serious music and culture can bring. I stumbled upon Radio 3 when I was a teenager, and it opened a door to an endlessly fascinating world of sound and thought that has nourished me ever since. I want everyone to have that chance and am proud to be able to make sure they will." Radio 3 has around 1.9 million listeners per week in the UK, but was recently overtaken in the ratings by digital radio station BBC 6 Music for the first time. Mr. Davey´s predecessor was also director of the BBC Proms, but the jobs have now been split and another appointment will be made to run the Proms. Mr. Davey will oversee the BBC´s six performing groups, which include the BBC Symphony Orchestra, the BBC Philharmonic and the BBC Singers. BBC director general Tony Hall said Radio 3 was "a true icon of classical music and cultural broadcasting in the UK. Alan Davey has a formidable track record in the arts and a depth of understanding only matched by his passion for classical music. His appointment marks a new chapter in the Radio 3 story - one that will extend and grow its rich history of excellence, innovation, and distinctiveness." Before joining Arts Council England, Mr. Davey worked for the Department for Culture, Media and Sport and Department of Health.